← Where are the Libertarians at Netroots Nation? One of the things I find really interesting about urban planning issues is that each city has its own unique story. I’ve mostly drawn my examples from Washington DC, St. Louis, Philadelphia, and New York because those are the cities I’ve lived in recently. But you can find similar stories in cities across the country. Here are some examples pointed out by readers. In 1964, when traffic engineers were even more ignorant about how cities work than they are today, the state completed I-30 by building the present elevated roadway. By that time, blacks had filled in the streets around Fair Park as Jews had moved to newer neighborhoods in North Dallas. In 1964, no black leaders had the political muscle to stop an elevated freeway from segregating their neighborhood from the rest of the city. 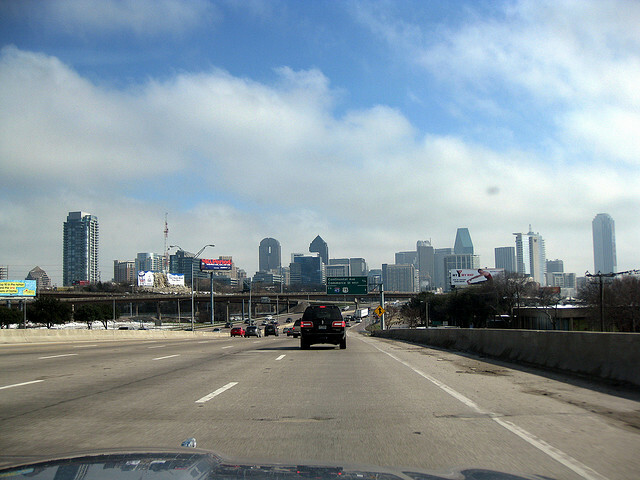 So the freeway was built, an act of unthinking institutional racism that rammed a barrier through Dallas’ most historic neighborhoods. The elevated freeway created poverty on both sides of the divide. Mansions on Munger and Second were cut up into apartments and boarding rooms. Only heroic action saved the blocks of Swiss Avenue nearest Lakewood. This predominantly African American neighborhood in St. Paul was displaced in the 1960s by freeway construction. In the 1930s, Rondo Avenue was at the heart of St. Paul’s largest Black neighborhood. African-Americans whose families had lived in Minnesota for decades and others who were just arriving from the South made up a vibrant, vital community that was in many ways independent of the white society around it. The construction of I-94 in the 1960s shattered this tight-knit community, displaced thousands of African-Americans into a racially segregated city and a discriminatory housing market, and erased a now-legendary neighborhood. The compromise proposed by some local genius was to make the new overpass (neccesitated by the wider freeway) into a city street by lining it with shops to “link rather than divide.” It is under construction now. I love that freeway cap in Columbus that is discussed in John’s link. Minneapolis sort of has a similar thing with the new Target Plaza, which covers part of I-394 and connects downtown to the new Twins baseball stadium (Target Field). I’d LOVE to see such a Columbus-style cap in Minneapolis to cover the awful I-94/I-35W trench just south of downtown. The trench separates downtown from the rest of the city, with the blocks just north and south of the trench being sort of dead and quiet despite the fact that they are within walking distance of downtown. Lastly, it wasn’t simply and only “planners” who allowed freeways to lead to urban neighborhood distruction. In fact, it wasn’t even mostly planners. The main culprits: local politicians who wanted to have interstate highways cut through their cities so they could control patronage construction jobs. Traffic engineers whose only concern was to design roads to move cars as swiftly as possible from one side of town to the other, without regard to neighborhood impact. A real estate industry that was looking to extract value from decimated urban neighborhoods as well as farmland sites. “Planners” helped make it happen, no doubt, but they were only facilitating the wishes of the power structure. The problem here wasn’t so much that any specific group of people hated cities. Rather, the problem is that the top-down decision-making process that produced the constructions plans failed to properly take into account the interests of those whose homes and neighborhoods were slated for destruction. The important point isn’t to apportion blame, but rather to figure out how to undo the damage, and to make sure similar mistakes aren’t made in the future. Interesting series. It highlights a really tough problem in making society more responsive to bottom up concerns. Any big change (freeway, park, leverage caps on banks, oil drilling regulation) involves some fairly strong coordination across a potentially large number of stakeholders. Sometimes we can get this with largely bottom-up processes, but sometimes we have to have something like eminent domain or regulatory authority to overcome fragmentation and the “tragedy of the anti-commons”. This series, and the whole body of work that Jacobs represents, illustrates how badly the large scale projects can turn out. But we can’t rely on pure bottom-up processes (and I don’t think Tim or Jacobs advocates that). So we need to get better at avoiding the destruction of value by big projects that is so common. Implicit in the way Tim and Jacobs talk about this seems to be a hope that we could maybe avoid the problems if we could understand the systems being modified well enough. Jacobs of course contributed a lot to our understanding of these systems. But understanding typically requires experiments, or at least a lot of relevant observations. We don’t seem to be nearly good enough at controlling the social costs of these experiments, or making and integrating observations to get a good understanding of how to do better. We pretty clearly under-invest in collecting information and improving our models. So my take-away from this series is that we need to improve our processes for integrating bottom-up goals and benefits, adapting large scale projects to local information, learning as much as possible from whatever large scale projects we do, and so forth. I guess we do better now than we did in the 1960s but I’m not even sure what the metrics are for improvement in these domains, much less how and how much we’ve changed. It seems like both pervasive networks and “virtual markets” would help. We need to get all the relevant perspectives represented, weighted according to the degree a project will impact them, and find ways to aggregate them that facilitate and guide good solutions. In the planning and execution of a project we need constant collection, aggregation and presentation of local information to all interested parties, and we need ways to aggregate feedback from those parties to guide the project. The ways that networks can help with this is probably obvious to anyone reading this blog. The virtual markets aspect maybe isn’t. Markets aggregate value and provide price signals to participants very efficiently and mostly bottom up. However in Tim’s and Jacob’s examples, the values involved are not adequately reflected in monetary values, so actual market mechanisms won’t provide good information to project management. For example, in a vibrant neighborhood occupied mostly by poor people, real estate values will be low, but the actual social value of living in the neighborhood may be high. This shows up when these neighborhoods attract young people like Tim who don’t (yet) have much money but are smart and know how to find good places to live. So we need to find market-like ways to aggregate value and negotiate about the allocation of value that reflect all the values involved, not just the direct monetary interests — and often only a somewhat perverse subset of even monetary values are represented in project planning. Creating this sort of market-like model isn’t actually that hard, technically, though it may be impossible politically. There are plenty of ways to measure trade-offs people are willing to make — Tim has been writing about the trade-offs he made about where to live. Once we have the data, integrating those trade-offs into a market-like model that helps evaluate alternative plans is feasible, though not easy. Political choices are still necessary but we can much better understand their consequences.